No matter what size jars Russell creates, they are always so perfectly scaled to size. 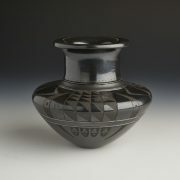 This all black small water jar is an example of that skill. 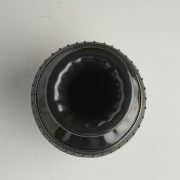 Notice the indented areas on the lip of the jar, flowing into the piece. He repeats those impressed areas on the top quadrant of the jar. Two strands of black hematite heishi act as a border for the panel with a whole row of hematite stones. 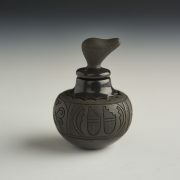 This can be referred to as a black gourd waterfall jar. It is stunning. Russell Sanchez was born at the San Ildefonso Pueblo. He has continued to live there all his life. Russell started making pottery at a very young age. 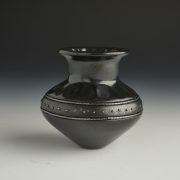 If you could see his pots from when he was thirteen or so – you would be able to tell that a great talent was emerging! Russell was greatly influenced by his aunt, Rose Gonzales, and was futher encouraged by Dora Tse Pe. Like Russell, Dora is also a perfectionist. But Russell is really a self-taught potter. 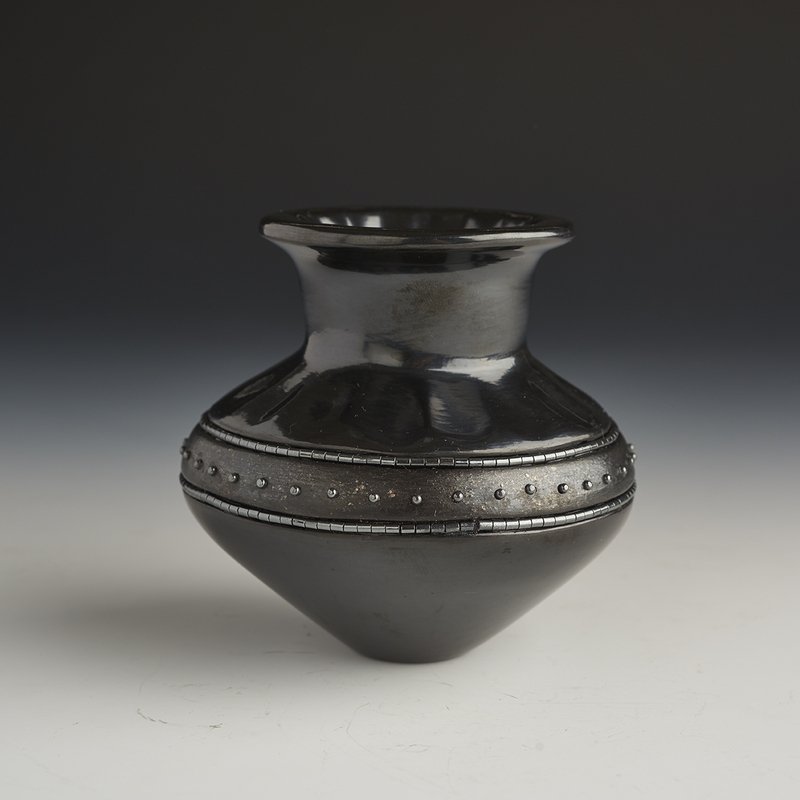 His incising, carving, and polishing techniques are all his own – developed and evolving over many years of hard work. 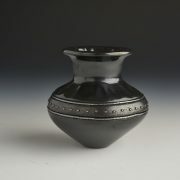 His work is widely accepted by serious collectors of some of the finest Native American pottery made today. He often introduces different materials into the clay while styaing within the traditional construction and firing techniques of pueblo pottery. Russell has won numerous awards and honors in juried shows every year since 1978. He has works in the permanent collections of the Smithsonian Institute, the Millicent Rogers Museum, the Museum of Indian Arts and Culture (Santa Fe) and the Museum of Natural History (Los Angeles). It is an honor to work closely with Russell, and represent him in our gallery.